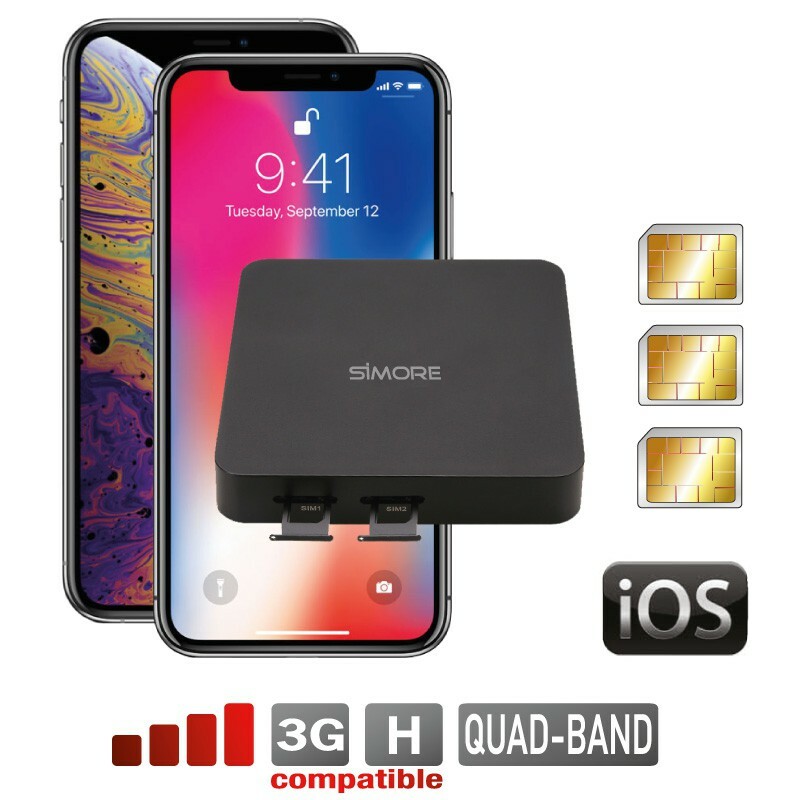 DualSIM@home is a new generation of adapter which turns your iPhone into simultaneous Dual or Triple SIM smartphone without having to carry any extra other device. DualSIM@home stays at home connected to your Internet router. DualSIM@home is using the internet to transfer incoming / outgoing calls and text messages to your iPhone over the SIMPlus Application. The DualSIM@home converter allows to use 2 or 3 phone numbers active at the same time on your iPhone. DualSIM@home has no distance limit and an unlimited connection. With its stylish and functional design, DualSIM@home stays at home or at the office while you are enjoying 2 or 3 SIM on your iPhone, wherever you are and at any time. You travel as you want with your iPhone and use it as a dual or triple SIM smartphone, without worrying about bringing your SIM cards or your DualSIM@home converter with you. You can make and receive calls, send and receive SMS, all with two or three SIM cards simultaneously on your iPhone. You can manage your calls and messages on two or three phone numbers active simultaneously from the screen of your iPhone and centralize all data of your 3 SIMs (phone book, SMS, call logs ...) on one mobile. SIMPlus App is available on Apple Store. The DualSIM@home adapter works with the SIMPlus app (available on AppStore) to communicate with your iPhone through Internet. - Download the SIMPlus App from the App Store to install it on your iPhone. - Insert 1 or 2 Nano SIM cards into the DualSIM@home device. - Plug it into your power outlet and connect it to your Internet / Wifi router via the provided RJ45 cable. - Activate the data on your iPhone in 3G / 4G or through Wifi. - Once connected to your Internet home router, DualSIM@home transmits calls and SMS to your iPhone by Internet via the SIMPlus application. - Your iPhone has to be connected over the 3G / 4G or Wi-Fi to receive calls and SMS transmit over the Internet by the DualSIM@home device through the SIMPlus application. With its simple and intuitive interface, the SIMPlus app allows you, at a glance, to select the right SIM card, access your contacts and messages, view your networks information, mobile phone provider and signal strength. Turn your iPhone into a Dual or Triple SIM cards phone. Works also with iPad and iPod to convert them into Dual SIM phone. Stays at home connected to your Internet router, no need to carry it. Easy to use: Simply download and install the SIMPlus app from the App Store on your iPhone. The SIM-1 area supports GSM 3G WDCMA CDMA SIM cards, the SIM-2 area supports GSM 2G SIM cards only. Can I choose the SIM card I want to use to make calls or SMS ? Yes, the SIMPlus app allows you to select the SIM you want to use for calling your contacts or sending messages. What languages does SIMPlus app cater for ? The SIMPlus app caters for English, French, German, Italian, Spanish, Arabic, Russian, Vietnamese, Japanese, Chinese, Korean, Turkish, and Dutch speakers. Can I receive calls and SMS simultaneously on 2 or 3 SIM cards with the DualSIM@home converter ? Yes, the DualSIM@home router adapter is a Dual and Triple SIM system with simultaneous connection that allows you to use 2 or 3 active SIM cards at the same time on one smartphone. What size formats of SIM cards can I use with into the DualSIM@home adapter? The size format of both DualSIM@home SIM slots is the nano SIM format. What is the DualSIM@home battery life ? The DualSIM@home Dual Triple SIM router adapter has an unlimited autonomy. It has no battery and plugs directly into your power outlet. Do I need to unsimlock or jailbreak my iDevice to use DualSIM@home triple dual SIM active router converter ? No, you don't need to unsimlock or jailbreak your Apple device to make it work with the Triple Dual SIM adapter DualSIM@home. Can I use my Bluetooth devices simultaneously with the DualSIM@home Triple SIM active adapter ? Yes, it is possible to connect at the same time your bluetooth system (for example Apple Watch, Galaxy Watch, Hands-free headset or car kit) to your mobile phone. How far should the DualSIM@home converter be from my smartphone ? There is no distance limit. DualSIM@home stays at home or at the office while you are enjoying 2 or 3 SIM on your mobile, wherever you are and at any time. I want to have 4 or 5 SIM cards, or more, on one mobile. Is it possible ? Yes, you can mix one DualSIM@home router converter with one X-T 3G/4G adapter. You will have 2 or 3 SIM cards active simultaneously and from 1 to 4 extra SIM cards with switching on one single phone.